Now here’s something. Did you know that a third of the world’s wine comes from Italy? Looking around the local shops, you’d never have guessed. 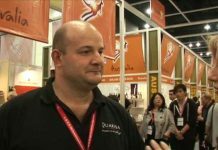 Apart from Italian specialist shops like Aroy Italy on Sukhumvit Road or Made in Italy in Jomtien, most of the supermarkets around here have very few Italian wines on offer. One well-known supermarket in Central Pattaya appears to have none at all. The Etruscans and the Greek settlers produced wine – of a sort – in Italy long before the Romans got started, with the result that Italy has some of the oldest wine-producing regions in the world. Grapes are grown almost everywhere and there are more than a million vineyards up and down the length of the country. There are thousands of different Italian wine grapes too. 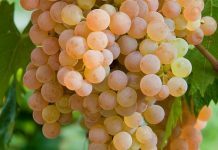 Italy’s Ministry of Agriculture and Forestry has documented around 350 grapes and granted them “authorized” status but there are evidently more than 500 other documented varieties in circulation. Needless to say, navigating your way through this lot is something of a challenge. Italian wines have come a long way from the old “spag and vino” image of a simple rustic glugger. There are still a few dodgy ones around and if you don’t want to be caught out, look for wines from reliable companies such as Banfi, Bolla, Corvo, Frescobaldi, Lungarotti, Palazzo Grimani, Ruffino and Zonin. There are many others of course, but these are the names you are likely to see in this country. You can also avoid dubious wines by remembering the four Italian wine classifications which I shall attempt to explain. So please sit up and try and look as though you’re interested, especially those people shuffling around at the back. Right then. At the top of the tree are (1) wines labelled Denominazione di Origine Controllata e Garantita (DOCG) and these are about the best that it gets. 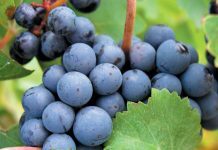 The DOCG classification covers a relatively small number of first-class wines but the regulations are strict and fewer than a dozen regions meet the regulations. One notch down come (2) wines labelled Denominazione di Origine Controllata (DOC). These must be made in certain areas specified by the government but they’re subject to fewer regulations than DOCG wines. The next level is (3) wines labelled Indicazione Geografica Tipica (IGT), wines from specific growing regions and some of these are exceptionally good. I won’t explain the reasons, because I can see your eyes glazing over already. Just remember that IGT wines are not necessarily “third class”. At rock bottom are (4) wines known as Vino Da Tavola (VdT) which are sometimes not much more than feeble plonk. Very few rules govern these wines except that they’re not supposed to be actually poisonous. However, I have tasted some that get pretty close. 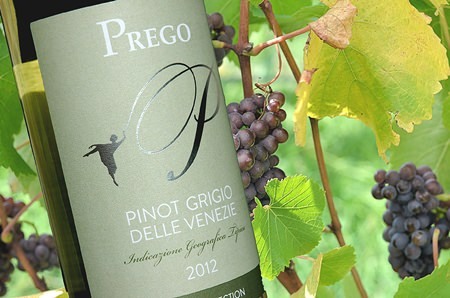 Pinot Grigio (PEE-noh GREE-joh) is Italy’s most popular white. It’s usually light and vivacious, a bit like I used to be forty years ago. It’s fruity, easy to drink and ideal with an informal meal. Pinot Grigio is always intended to be enjoyed when it’s young. To make this fresh-tasting wine, the grapes are usually harvested fairly early and then fermented and stored in stainless-steel tanks rather than oak barrels. In this case, the letters IGT indicate that the wine comes from the Friuli-Venezia Giulia region, up in the top north-eastern corner of Italy, the traditional centre for Pinot Grigio production. And in case you’re wondering, Pinot Grigio is the same grape as the French Pinot Gris although they are usually made into completely different styles of wine. Typically, this is a pale, straw-like yellow colour with a slight greenish tinge. Poke your snout into the glass (assuming that your glass is big enough) and you’ll pick up a lovely delicate floral aroma of fresh apples with faint hints of citrus, pears and melon. On the palate, it’s light and refreshing with white fruit and an attractive zingy dash of acidity. It’s completely dry and has a satisfying, long dry finish. Pinot Grigio works well with lighter fare and also with fish dishes, veal and poultry. By the way, if you want to pronounce the name like an Italian, remember that the second word has two syllables, not three. It also helps to wave your arms about too. Chianti (kee-AN-tee) is one of the most well-known Italian reds and the perfect accompaniment to traditional Tuscan foods. It invariably goes well with pizza or rich colourfully-flavoured pasta dishes. Chianti is not a grape variety, but a vast wine-growing region in central Tuscany. Years ago, the wine came in a rustic-looking flask-shaped bottle enclosed in a straw basket and known as a fiasco, but these days most Chianti comes in a standard wine bottle. The wine is in the DOCG category and if you’ve been concentrating, you’ll know what that means already. The Zonin family has been in the wine business since 1821 and owns well over four thousand acres of vineyards, making it the largest private vine growing and winemaking company in Italy. This ruby-red wine has really quite an intense aroma especially if you allow a bit of time for the air to do its work. The aromas are dominated by wild berries, a hint of sour cherry, violets and a kind of perfumed spiciness. You might also notice the distinctive aroma of capers. Perhaps there’s a dash of rhubarb too. Now if all these smells sound a bit odd, they are fairly typical of Sangiovese (san-joh-VAY-zeh) which traditionally makes up the largest proportion of Chianti blends, 95% in this case. The remaining 5% is Canaiolo, a black-skinned grape grown all over Italy and nearly always used for blending. On the palate, you’ll get the typical Chianti “bite” which makes the wine such a good food partner. It’s very dry with a smooth mouth-feel; medium-bodied with pronounced raspberry and cherry flavours, along with a dash of spice. It’s only 12.5% alcohol content, well-balanced with soft tannins and a long, dry and fruity finish. Italian wines are made for food and Chianti is no exception. It is perfect with the richly-flavoured dishes of Tuscan cuisine. After ageing for about three years, it becomes the ideal companion of every type of roast, grilled red meat, game and mature cheeses. The distinguished winemaker Piero Antinori suggests that you could drink Chianti with Bistecca alla Fiorentina (Florentine beef steak) roast beef, roast turkey or even wild boar, if you can manage to catch one. In many ways this is a text-book Chianti; an excellent example of a classic wine. It’s as Italian as a Lamborghini.